Examples, solutions, videos and lessons to help Grade 5 students learn how to connect area diagrams and the distributive property to partial products of the standard algorithm without renaming. 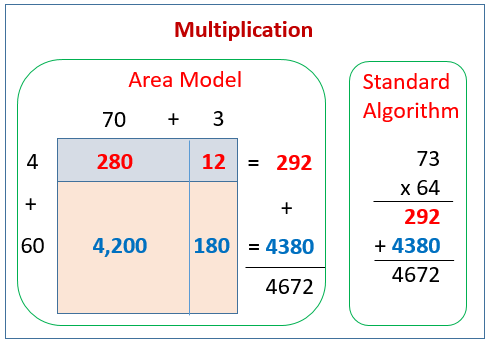 The following figures give an example to compare multiplication using the area model, partial products, and the standard algorithm. Scroll down the page for more examples and solutions. 1. Draw an area model, and then solve using the standard algorithm. Use arrows to match the partial products from your area model to the partial products in the algorithm. 3. Each of the 25 students in Mr. McDonald’s class sold 16 raffle tickets. If each ticket cost $15, how much money did Mr. McDonald’s students raise? 4. Jayson buys a car and pays by installments. Each installment is $567 per month. After 48 months, Jayson owes $1250. What was the total price of the vehicle? This video shows how to use more complex area models to solve double digit multiplication problems.